Woody Allen's latest European foray, Cassandra's Dream, is a serviceable thriller, with a great cast of British actors. 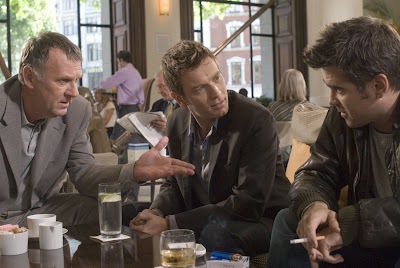 Colin Farrell and Ewan McGregor play Terry and Ian, brothers who are in need of money. Dumb, but noble, Terry needs it to pay off some pretty high gambling debts. Smart schemer Ian, needs it to impress his new girlfriend, Angela (Hayley Atwell) with his latest half-baked investment plan. They turn to rich Uncle Howard (Tom Wilkinson) for help. But Howard takes the opportunity to enlist the boys for a favor of his own. He'll help them IF they get rid of a business partner about to sell him out to the cops over some shady dealings. Part of the fun here is to see the spectacular cast squirm, manipulate and betray each other through the proceedings. McGregor is particularly oily in his performance, bullying his younger brother into conforming with the plan in order to avoid jeopardizing his new relationship. On the flip side, McGregor is also up to playing his character's naivete, as his actress girlfriend is obviously a golddigging tart already sizing up her next conquest before his eyes. Wilkinson is effective in his brief part, conveying his desperation while not letting the boys' inexperience in crime bring down his own plans. Farrell is the one who's most sympathetic, as his simple-minded gambler, seems to at least have his heart in the right place, if not his head. He generally has noble intentions, wanting to provide for his fiancee, but is unable to shake his gambling addiction. The main flaw is the predictability of the plot. We've all seen this noir staple before. Sidney Lumet even depicted a variation on this theme to better effect in the superior Before the Devil Knows You're Dead. But where Lumet used pace, setting, and circumstance to affect a tone of believability and surprise, Allen's direction is mired in cliche. For example, out on a date with a coworker, Ian drives past a car broken-down on the side of the road with a woman working under the hood. He turns around to help, and meets his future love, Angela, who will lead him to his inescapable tragic fate. Now, why is it that I, a somewhat nice, average guy, rarely stop to help a stranded driver, yet these cinematic ne'er-do-wells, always do? Allen is lucky to have actors at his beck and call, most likely because of the reputation he's earned on his older films. But he should slow down his prodigious output and put a little more effort into the stories he's been churning out lately.